Part II Oath-taking Ceremony of the successful examinees in the Librarian Licensure Examination given by the Board of Librarians on November 2011. Part III Lecture-Forum on “Ethical Considerations in Library Collection Development and Management. 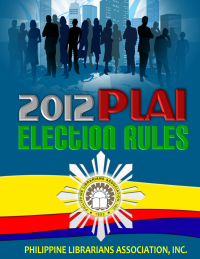 Free registration forpaid members of 2011, Php 250.00 for non-members and Php 100.00 for students. For inquiries, please contact the PLAI office at nos, 5259401, Elvie Lapuz at 9818500 local 2865 / +639178553228 or any of the Association’s officers/directors. We will greatly appreciate your sharing of this information with others.